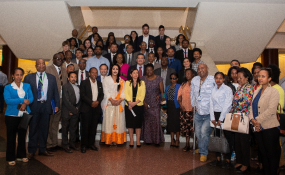 Addis Ababa, 29 November 2018 (ECA) - A landmark event in Addis Ababa has called on African countries to promote the rights and welfare of children and adolescents with disabilities. The call was made during the launch of a global campaign for the "Good Treatment of Girls, Boys and Adolescents with Disabilities in the World", on Thursday 29 November 2018 at the United Nations Conference Centre. Co-organized by the Economic Commission for Africa (ECA), with the Special Envoy to the UN Secretary General on Disability and Accessibility, Maria Soledad Cisternas Reyes, and the Embassy of the Republic of Chile in Ethiopia, the launch brought together more than 100 high-level government representatives, diplomatic missions based in Ethiopia, UN agencies, civil society and persons with disabilities to launch the official awareness raising campaign '10 principles for my protection, well-being and development as a girl, boy or adolescent with disabilities' in Africa. In her opening remarks, Ms. Thokozile Ruzvidzo, Director, Social Development Policy Division, indicated that like in most parts of the world, millions of children and adolescents with disabilities in Africa, experience profound discrimination and severe violation of their rights, which prevented them from reaching their maximum potential and contributing fully to society. At regional and national levels, she underlined, member states are introducing policy measures to domesticate the global frameworks such as the Convention on the Rights of Persons with Disability and the Convention on the Rights of Children, and 2030 Agenda for Sustainable Development, promote and protect the rights of children and adolescents with disabilities. In spite of such strides made, there are still persistent gaps between policy and practice. Implementation of disability policies potentially have several challenges including weak institutional capacities, limited resources, and poor monitoring and evaluation processes. Limited data continues to hinder the accurate measurement of the wellbeing of children with disability. "These are all reasons why we need the Special Envoy's campaign for the "good treatment of boys, girls and adolescents with disabilities", she stressed. "The campaign shines a light on one of the most insidious and the most invisible forms of rights violation against children with disabilities: the right to live a life free of abuse and violence," said Ms. Ruzvidzo,. "Through the 10 principles of the Campaign, we hear the often absent voice of children with disabilities demanding to be accepted in all their diversity. These principles express their aspirations to be recognised, respected and loved – basic and fundamental conditions that deeply affect their development process." For her part, Ms Ergoye Tesfaye, the Minister of Labour and Social Affairs, Ethiopia, stated the country has made major strides since the 1990s in the promotion and protection of human rights including the rights of persons with disabilities. Ethiopia has also ratified the UN Convention on the Rights of Person with Disabilities in 2010 that has contributed to further reinforce the mainstreaming of the issues of persons with disabilities in different government sectors. "Although improvements have been demonstrated in awareness raising, accessibilities in some buildings, transport, road, education, health," she said, "there are still gaps that we require a long way to go. We believe we can bridge the gaps through continued educational and capacity building efforts. For this, all round assistance and cooperation are indispensable in support of national efforts for the success of our endeavors." She indicated that the Ministry of Labor and Social Affairs has established a separate directorate to treat the issues of persons with disabilities. She emphasized that the Ministry was highly committed to working with all stakeholders including the international community to build a sustainable system for the benefit of boys, girls and adolescents with disabilities. In a statement read on her behalf, the AUC Commissioner for Social Affairs, Ms Amira Elfadil, reiterated the Commission's commitment to eradicate all forms of bad treatment of girls, boys and adolescents with disabilities in Africa. She cited the killing of people with albinism in some parts of Africa where body parts were used for witchcraft because of superstitions as one area that the AUC is ceased with. She shared the efforts that the AUC was putting in place to address the challenges, including among others a draft framework which will guide Member States in the development of national policies and strategies to combat abuse of persons with disabilities. Also speaking at the event, the Special Envoy to the UN Secretary General on Disability and Accessibility Ms. María Soledad Cisternas Reyes, who presented the "Global Campaign for the Good Treatment of Girls, Boys, and Adolescents with Disabilities in the World", stated that the aim was to raise awareness on eliminating degrading treatment or punishment, exploitation, violence and abuse of all girls, boys, and adolescents with disabilities. She called on the ECA, the AUC and all stakeholders involved, to not only disseminate the materials promoting the 10 principles, but to also ensure the follow-up of the campaign and implementation of the principles for the welfare of children and adolescents with disabilities at the continental and national level. Participants reiterated their commitment to support efforts to eradicate challenges faced by children and adolescents with disabilities and promoting and implementing the 10 principles of the campaign.